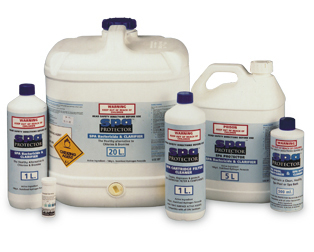 The Spa Protector range of chlorine FREE spa chemicals is the complete SPA CARE SYSTEM which uses Hydrogen Peroxide as a bactericide and clarifier. The active ingredient has a 19% strength, which oxidises bacteria and organic materials in the spa, leaving the water clear and odour free. • Allergy free & non-irritant. • Environmentally friendly & biodegradable. • Spa Pool Conditioner & Spa Bath Cleaner - used to remove the build up of contaminants in the Spa's pipework. • Spa Cartridge Filter Cleaner - supplied with a trigger spray. • Hydrogen Peroxide Test Strips.